I have loads of tasty granola recipes, some easy and basic, and some wildly complicated with fancy ingredients. And I look forward, every year, to making, and giving jars full as Christmas gifts. 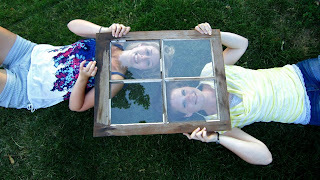 Kayla and Jessika to the rescue!! This year however, because of my knee injury, I was unable to stand for any length of time (which included time in my beloved kitchen), so my oldest daughter Jessika, and her best friend Kayla, offered to make my Christmas granola. Since they were in charge of making it, I wanted a recipe that they would be familiar with, or had made before. I knew Kayla had a really yummy recipe that had been in her family for years, and I'm SO thankful she graciously shared with us for this year's granola-making day. I'm also so thankful my girls (AND their friends) are talented and and careful cooks - the granola turned out BEAUTIFUL. We (well, THEY) added green pumpkin seeds and red dried cranberries for a festive "Christmas-color" touch, but you can use whatever fruits, nuts or seeds you prefer! I'm sharing the recipe with you giving complete credit to Kayla and her Mom, and I hope you enjoy it!! It's quick and easy (just takes time to bake) and there's plenty of room for whatever variations you'd like... A triple recipe makes four cookie-sheets full and is a perfect amount for sharing. Measure all dry ingredients, including nuts and dry fruit, into large mixing bowl. Stir (I use my hands) until well mixed. In food processor or blender, mix honey, water, oil, vanilla and salt until well blended. 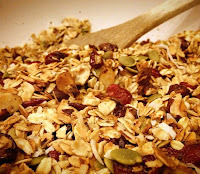 Pour liquid over dry ingredients and mix well with your hands, squeezing granola occasionally to make "clumps" and work moisture into the oats. When thoroughly mixed, spread in a thin layer on large cookie sheet or two. 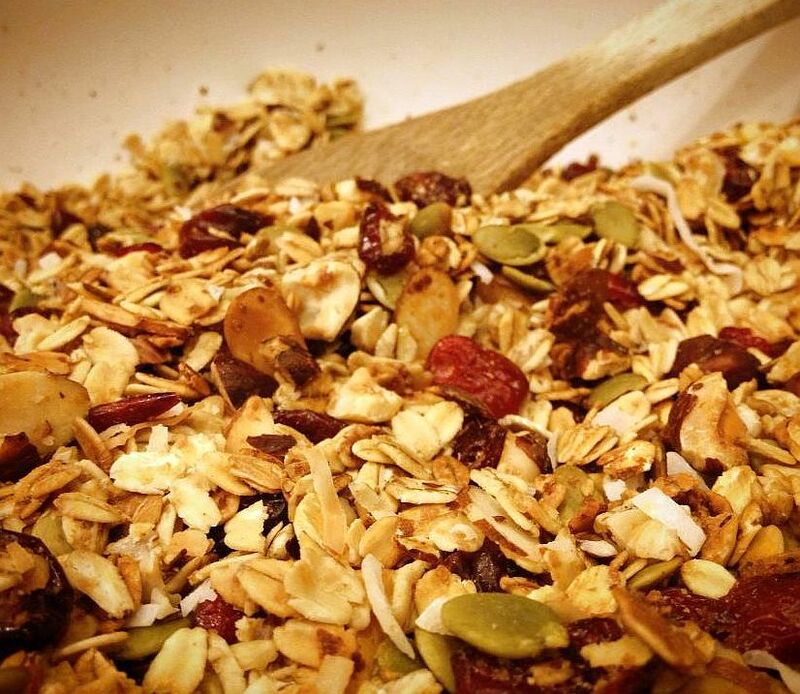 Squeeze some of the granola firmly into chunks or clumps if you like a more "clumpy" texture. Bake in 250° oven for an hour, to an hour and a half, turning every 30 minutes, until granola is toasty golden colored and dried out. (You will drool the entire baking time!) Leave on cookie sheets to cool and then store in covered canister. I'm adding the ingredients to my shopping list now! yum! 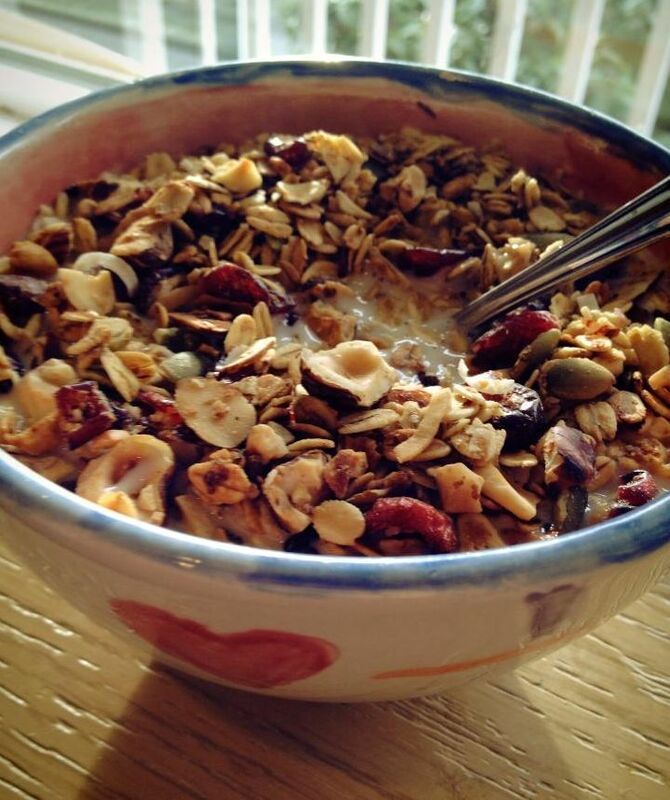 I love homemade granola so much! :) Sorry to hear about your knee, but I'm glad you had such excellent helpers. Love the window pic and the Granola, of course@! I made mine exactly like the recipe..especially the hazelnuts, yum....it is a really, really GREAT granola. I will be making this at non-Christmas times all year. Thanks for sharing this recipe. Hope you are feeling better and all healed very soon. Yum! Used agave instead of honey, only almonds, and added some toasted rice cereal. So good!